Thua Thien-Hue (VNA) – The Hue Relics Preservation Centre and the Tuoi Tre (Youth) newspaper held a ceremony in the ancient city of Hue on August 29 to receive holy earth from Truong Sa archipelago to mix into “Xa Tac” platform. The ritual, Te Xa Tac (Worshipping Genies of Earth and Crop), performed on the Xa Tac Platform in the former royal capital of Hue, is one of the most important rituals conducted by kings under Vietnam’s feudal dynasties to pray for peace and bumper harvests. The Xa Tac Platform was built in 1806 under the reign of King Gia Long (the first king of the Nguyen dynasty). The contemporary court ordered provinces across the country to select clean and solid earth for making the platform in Hue to symbolise national unity. The platform itself stands for the country as a whole. Deputy Editor-in-Chief of Tuoi Tre newspaper Le The Chu said the earth received from Truong Sa archipelago reminds the significant contributions of ancestors to national independence and reunification. 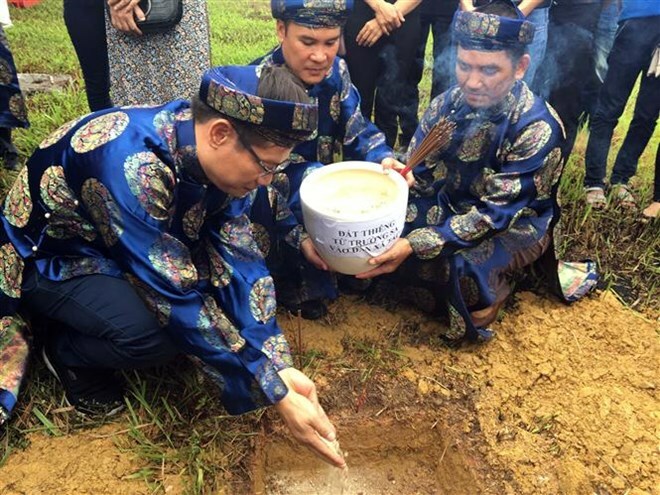 Director of the Hue Relics Preservation Centre Phan Thanh Hai said in May 2017, the Tuoi Tre newspaper and the Vietnam People’s Navy also organised a ceremony to send Hue’s holy earth to Truong Sa archipelago.